X-Gin is the result of a collaboration between Xolato and the Stokerij De Moor Distillery in Belgium, and it focuses on cocoa beans as one of 46 botanicals (also including vanilla pods, hazelnuts and almonds). 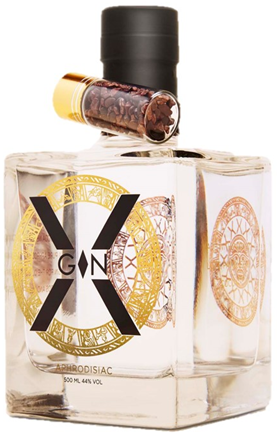 Launched in 2015, X-Gin is inspired by the Aztecs and their use of cocoa beans, as is the branding and the striking 50cl bottle. X-Gin is a truly modern gin - light on juniper and with an abundance of innovative flavours. Straight out of the freezer it is a tasty digestive and in a gin and tonic a wealth of sweet, dessert flavours are brought to life, from vanilla and banana to hazelnut and lemon. With 46 botanicals there is a complexity to Xolato Gin, and the juniper, cocoa and pepper give some balance to the sweetness. An unusual and very moreish gin. For another gin that works well with desserts, try the lemony Malfy Gin or the minty Skin Gin. Botanicals: 46 botanicals including juniper, vanilla pods, hazelnuts, almonds, dried pepper, cacao nibs, lemon, dried raspberry, dried banana, hazelnut & wild chillies.